Have you started to experience weird behavior when you are using a program like Firefox, Chrome, Excel, Word or Powerpoint? Sometimes this behavior can be something like a mouse that is lagging, delayed clicks, or features that aren’t working at all, or are taking forever to finish. Many times this is occurring due to a feature in those programs called “Hardware graphics acceleration.” This means that the application is using the hardware on your computer (such as your video card) to complete some of the processing work that the program needs to complete. Often this can help the program to run smoother but, occasionally, it can result in the behavior that is making the program difficult, if not impossible, to use, and which ultimately led you to this article. 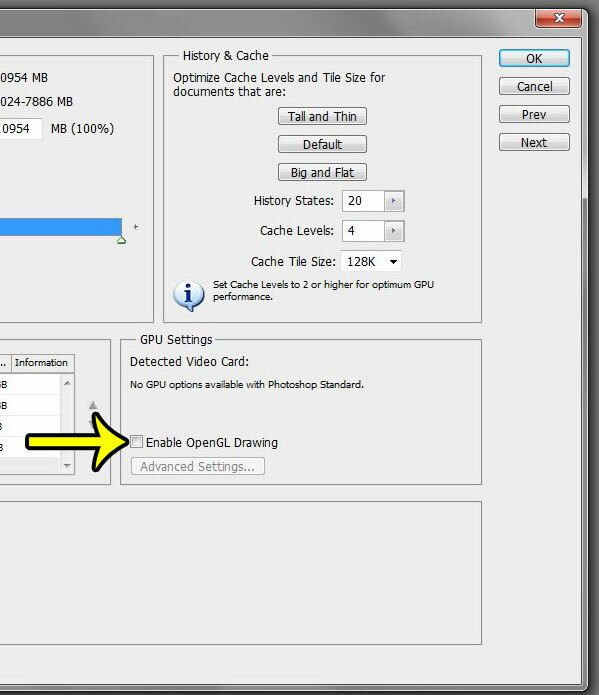 Our guide below is going to show you where to find the hardware graphics acceleration options in a number of popular programs so that you can turn them off as a troubleshooting step. All of the programs below in which we are disabling hardware acceleration are installed on a computer running Windows 7. However, these steps are very similar if the programs are installed on Windows 10. 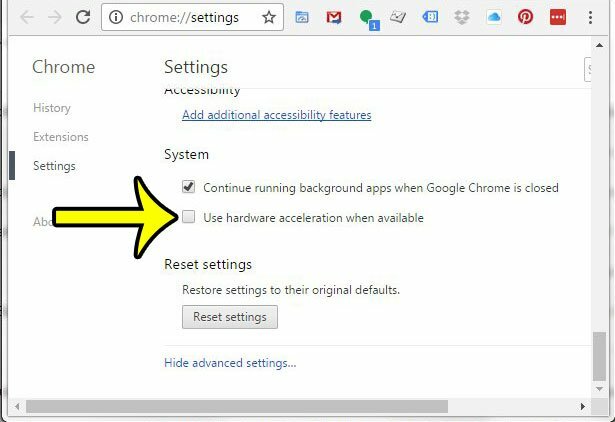 Uncheck the Use hardware acceleration when available option. Click the Customize and Control Google Chrome button at the top-right corner of the window. 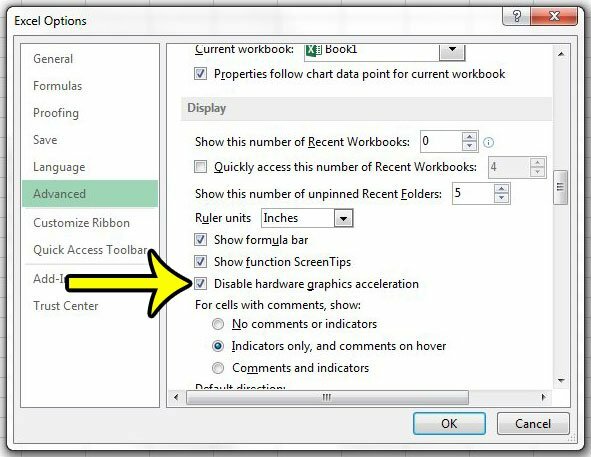 Scroll to the System section at the bottom of this menu, then uncheck the box to the left of Use hardware acceleration when available. Click Options at the bottom of the column on the left side of the window. Click the Advanced tab at the left side of the window. 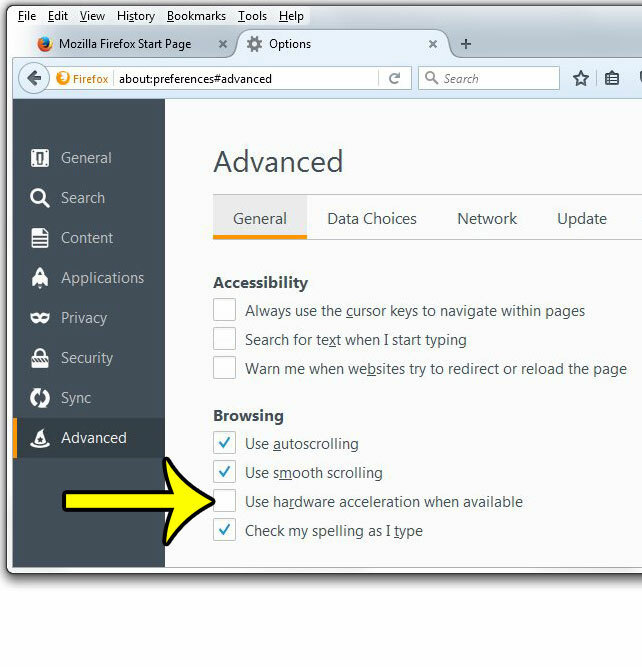 Scroll down to the Display section, then check the box to the left of Disable hardware graphics acceleration. Click the OK button at the bottom of the window to apply your changes. Click Edit at the top of the window. Click Preferences, then click Performance. Uncheck the Enable OpenGL Drawing option. Right-click on the desktop, then click the Personalize option. Click Display at the bottom of the left column. Click the Change display settings option in the left column. Click the Advanced settings link at the center of the window. Click the Change settings button. If this is grayed out, then you display adapter settings are being handled by another program, such as the ATI Catalyst Control Center and you will need to change the settings in that menu instead. Drag the Hardware acceleration slider to the None side, then click the OK button. Why Is Only Part of My Spreadsheet Printing in Excel 2013?